Today, I received a snail mail postcard from the mothership regarding Club Slingshot. Basically, it seems they are trying to establish an owners group controled by polaris. I'm just a little hesitant, or maybe just paranoid. Does anyone have any insight into this? 2016 Bluefire LE, the fastest color. I just picked up my slingshot on Thursday and I too have seen the Club Slingshot. I went ahead and registered as I figured it is pretty benign. I thought it was interesting that the membership was at no cost for a year but didn’t see a cost for time after that. So far no email’s from that so I’ll see what comes. Kinda lame at this point IMHO. 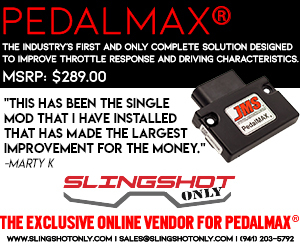 got mine by email -- tried to enter my vin # and it said it did not exist and to call customer service -- so i guess i don't really have a slingshot ??? If done right, it could be a good way for owners to get the ear of Polaris rather than nashing and bashing them, wouldn't that be wonderful? Got my invitation to hook up. Curious how the Polaris moderation will work? Yep - I got the postcard today as well. Went to the ClubSlingshot.com site and clicked the check your membership link. put in my VIN and last name and my information came up and was all correct except for e-mail it had the address of the sales person at the dealer. The post card says every new owner gets a free 1-year membership so I guess its automatic. I did correct the e-mail to mine. I got the card today also...my guess is they are trying to do something similar to what Harely does with the HOG club. That’s also has a membership fee. Just creating more public awareness...to increase sales.....I’m already doing that by riding as much as possible. Plus you won’t get reimbursed for gas. I have been and still am a member of the Gold Wing Road Riders Assoc... for a reference point the cost of membership is $55.00 yr. I have been a member of the local group for 20+ years and still want to support the group (I put out the weekly newsletter) --- probably won't renew when it runs out in two yrs. Not sure that is a cost that has much in the way of benefits. I have enjoyed the group and the rides we have done over the years.